We provide finest quality products which are specially processed. So when you buy these products the quality and efficacy is 100% guaranteed. Coriander holds a prominent position in the Indian kitchen. Coriander seeds, flavor many an Indian recipe with their richness. This spice is an important ingredient in pickling, curry, the Indian spice mixture Garam Masala, Curry powder & various Spice blends in India. 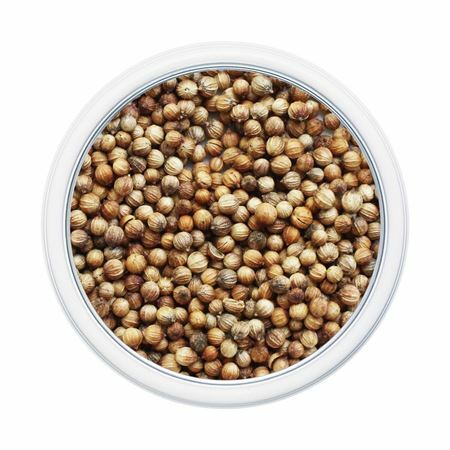 Coriander seeds should be kept in an opaque, tightly sealed glass container in a cool, dark and dry place. The whole seeds will stay fresh for about one year. Coriander helps to stimulate the appetite. Its seed can be used for making a medicinal tea to soothe an upset stomach, to treat indigestion, and mild gastrointestinal upsets. Coriander also help lower blood sugar, treats arthritis, lowers bad cholesterol and raises good cholesterol.